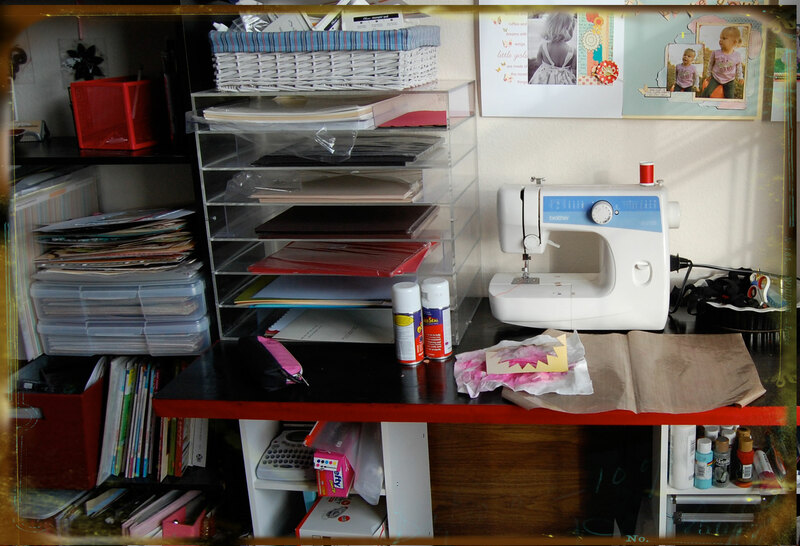 ok so really my bed is my happy place, but my craft room is definitely the next best thing. 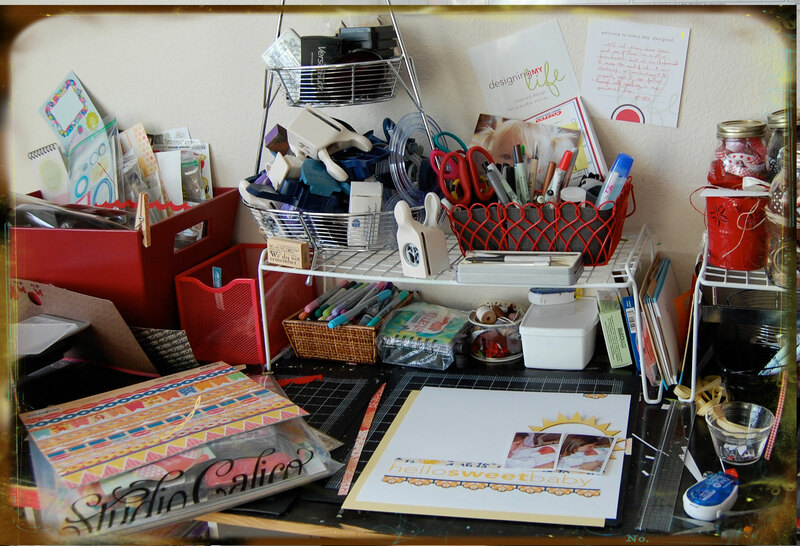 This thread on Studio Calico boards today got me thinking that I haven’t shared pics of the space in a long time, mostly because not much has changed. One of the great things about this room is an arched window that faces northeast, so it gets plenty of light but not too much harsh sun. the techie station… yes it’s old kitchen cabinets covered in BG paper and primas and home to the new wide format printer, paper, misc paint, and random cords and cables are stored inside. The top is the leaf for my dining table. I use these laundry shelves to give a little more space. The red leather tote on the left houses embellishments of all sorts and it has a twin that’s just out of this shot on the left that houses alphabets. misc baskets hold ‘essential tools’ This desk and it’s twins across the room is about as cheap as you can make a desk…closet organizers and a sheet of plywood stained black and multiple coats of poly. 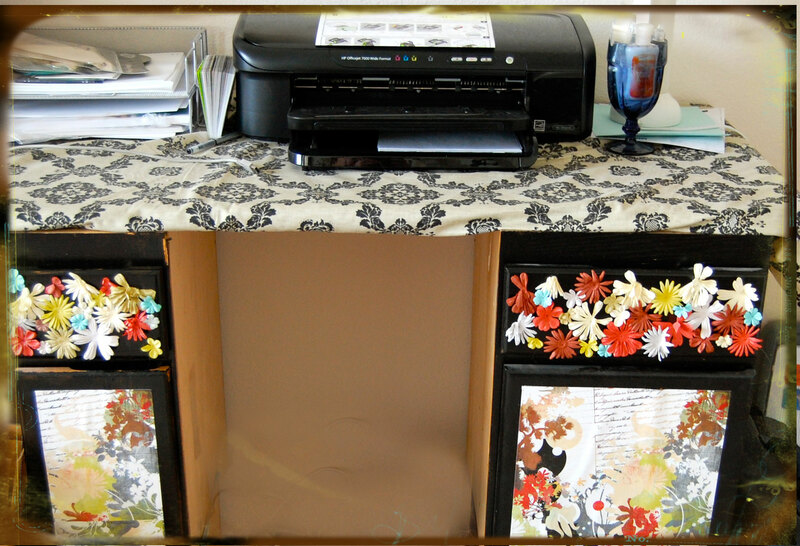 The shelves hold paper trimmers, photos, bins of more embellishments (brads, buttons, flowers, etc). I found this vintage shelf in my favorite antique store where I usually can’t afford much but in a stoke of luck this was priced just right. On the top are vintage spools from Tinsel Trading in NYC. 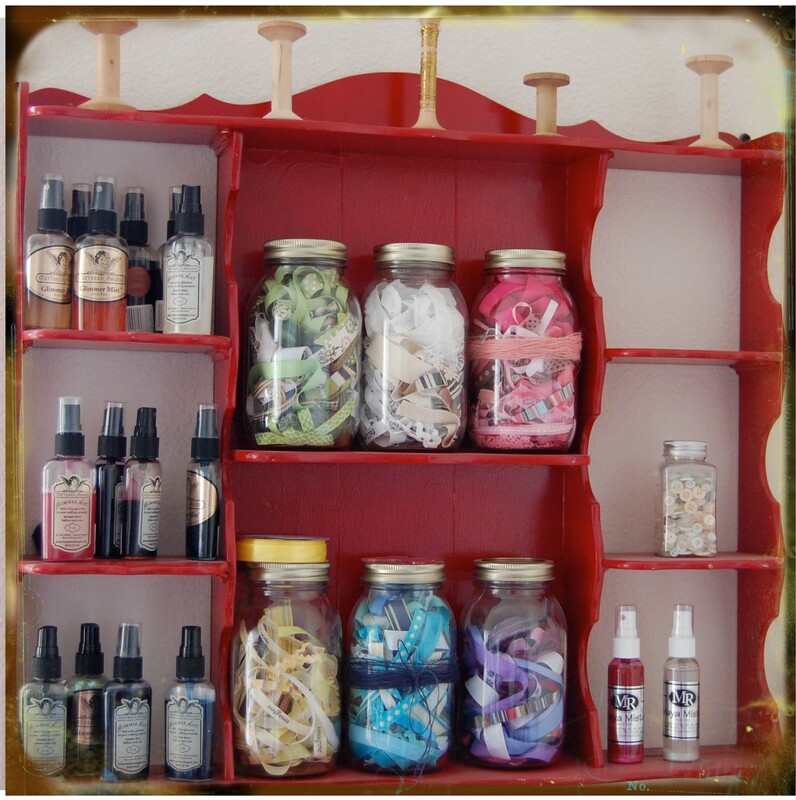 The center has mason jars of ribbons in colors I don’t use much (red, black and brown are closer to the desk) and I think I need some more mists to fill up the rest of the shelves, what do you think? 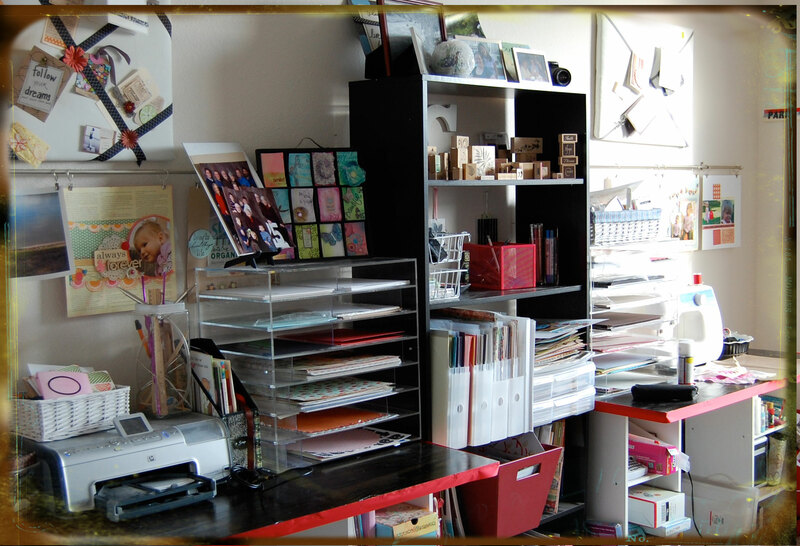 Below this shelf is the a dog kennel turned desk top that stores my crop tote, scrap basket(so out of control I dumped the photo in shame) and all of my Quickutz and other diecutting things. 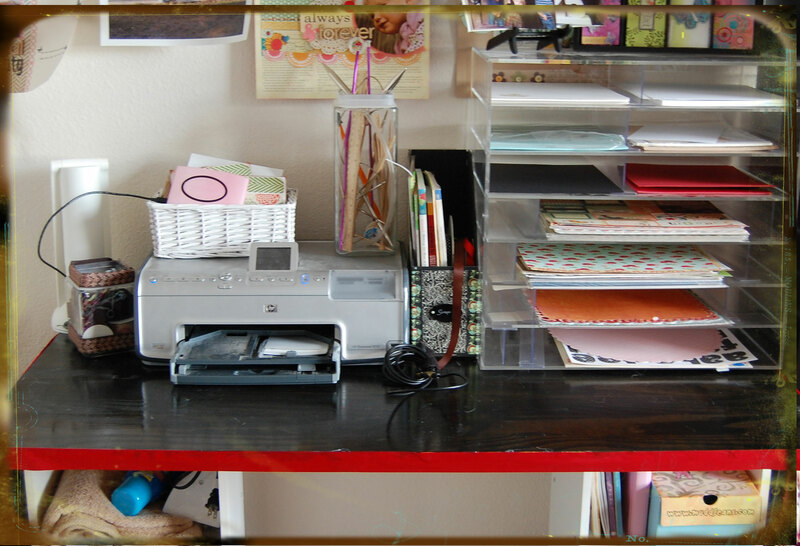 a good place to mist too…you can also see the cardstock shelf an acrylic shelf system I picked up with Scrapbook Destination closed this summer, love it! Basket of stampin’ up inks on the top. 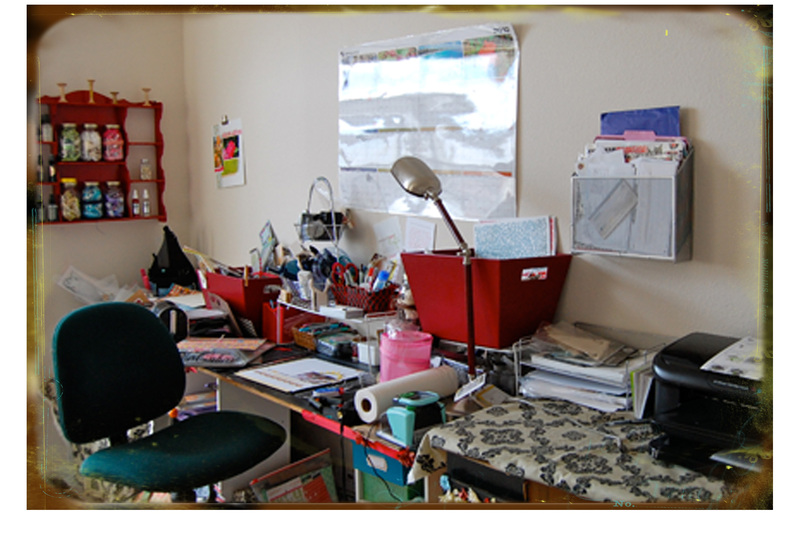 Above this desk and the other on this side of the room are curtain rods that hold finished layouts and above those a couple of padded bulletin boards. 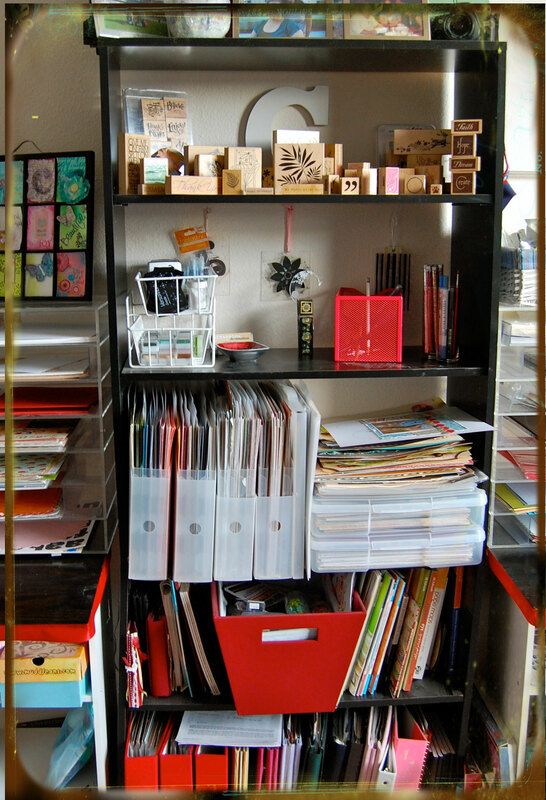 top shelf you can’t see has some special photos my original film SLR and a couple of other special trinkets, then it’s wood stamps, the next shelf has inks, glitter and other misc items, looks a little empty probably because items are being used at the scrappy desk, then it’s patterned papers and more cardstock, plus a stack of layouts that need to be put into albums (note, only one of the flat storage bins has layouts), then a shelf of idea books and a bin of chipboard, bottom shelf has albums, I’m slowly converting to all red AC. yes that is more cardstock and pattern paper. well that’s pretty much the 360 tour. Want to see more great spaces…click on the thread link at the top of this post.